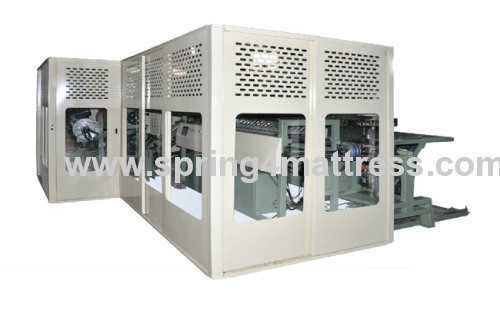 Bonnell spring unit production line HS-BSC60-L-BSA200, is latest model for producing mattresses innerspring units. It can produce innerspring units directly from wire. Firstly the steel wire is coiled to a spring, and then transferred and inserted to the assembler by the automatic feeding system. After this, the upper and lower springs are coiled together at the same time and helical wire is coiled, cut and clamped at both ends utomatically. When a unit is finished, it could be ejected automatically. Every system of the production line was managed by the automatic numerical control system, So it is high automatic operation and more safer, saved the man power, reduce the work intension, so the result is upgrade the work efficiency. Both the electrical parts and the structure of the machine are up to the CE. so that it is more safe and user-friendly. 1. Fully-automatic Bonnell spring units production. 2. Steady work capacity up to 26400 springs / 8 hours. 3. Operates without compressed air. 4. Rapid change-over and easy operation.